Inspiration is a funny thing. You never know when it will strike, or how. This project began as a spin-off inspiration from another project, where it took on a life all it's own. I was tearing apart a vintage built-up Monogram Paddy Wagon, donated by my buddy Don Richmond, for one of the rear bench seats. Once I had the model down to the chassis, engine and rolling stock, I remembered what I liked about the Paddy Wagon, the stance and the engine. I began a search through my many boxes of half-projects and donor kits, when I noticed a Revell Speedwagon that had been a complete model, but didn't survive a return trip from a Greater Salt Lake contest. It was one of those moments when everything clicks, and the final project comes fully formed in a vision. I HAD to build this model. With some color input from the Coffin Corner, I was off. 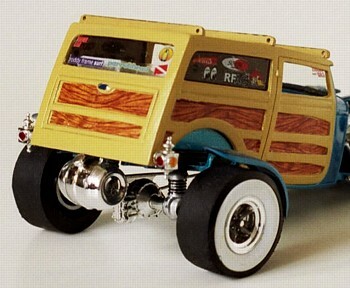 The chassis was slightly modified to allow the Speedwagon body to settle down into the right position. Sheet styrene was fitted into the wheel wells to close up the body, and to the interior panels to smooth them out. 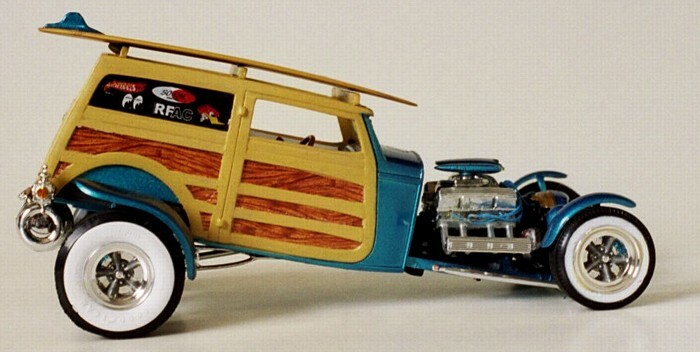 I had previously modified the Speedwagon's body by cutting away the entire roof section, and fitting it with scratch built surfboard racks. I had also modified the horizontal wood sections into a scalloped design, because I always thought a scalloped woody would look cool. 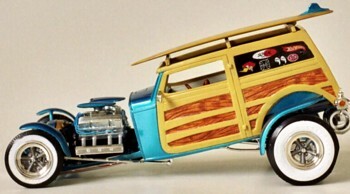 The tires are from the Paddy Wagon, airbrushed with Tamiya flat white to create the whitewalls. 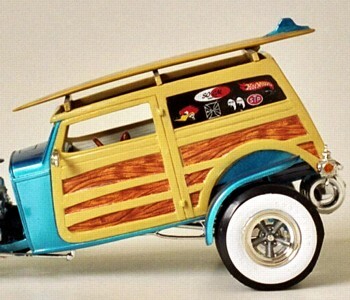 The wood grain decals inside and out are Slippery Arts Cartoon Wood. The seat pattern is Slippery Arts Swashbucklers. The miscellaneous sponsor decals are vintage re-creations and a few that reflect the interests of the builder. 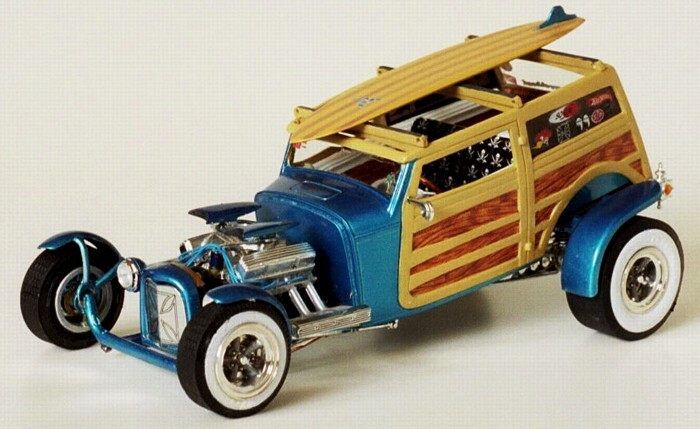 To my surprise, the Sport 'n Wood took 3rd place in the Street Rod category at the 2003 IPMS Region 5 contest. 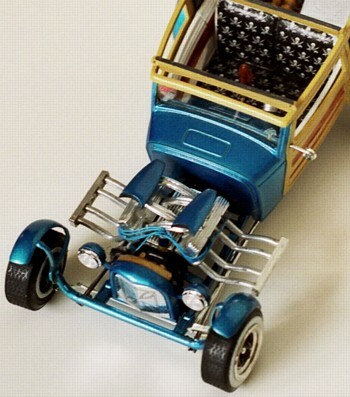 Paint-Humbrol Candy Blue (airbrushed), Tamiya chrome silver, semi-gloss black, flat white, German grey, yellow, clear red, clear orange and flat desert yellow.